"Counter Education" is our theme for January. It’s drawn from the 1970 publication Blueprint for Counter Education. Originally published by Doubleday, Blueprint is a boxset—or “portable toolkit”—with three charts and what the authors Maurice Stein and Larry Miller call a shooting script. The charts are like posters. They have constellations of names of radical modern and postmodern thinkers, designers, political theorists, sociologists, artists and movements in Western culture. The posters are easily pinned to walls to create a do-it-yourself learning environment. Stein and Miller wanted to foster a participatory curriculum emphasizing social interaction where learning occurs in dialogue without hierarchies. Instead of providing a precise roadmap for how to read the bevy of cultural references, Blueprint prompts groups to devise their own interpretative explorations. Ideologically, the process of knowledge production is prioritized over the final product." A bookshop, a learning site, an exhibition and public program, Curatorial Research Bureau unites education and consumerism inside a contemporary arts institution, prioritizing context—of art, ideas, people, places, and things—as an active ingredient in the practice of curatorial research. Information and Human Rights is a course offered at Pratt Institute, School of Information. The course explores the intersections of information and human rights and the ways in which information professionals can support and promote human rights. During Spring 2018 the twelve students in the class used the Blueprint as a guide and inspiration in their own attempts to create a Blueprint for Information and Human Rights. From a pedagogical perspective, the aim was to create a new kind of learning experience for students, one that give meaning to some over used phrases, such as “critical thinking”. To quote Gillmor “People are always learning things the way they’ve been taught to learn things. Here they are going to have to make their own decisions” (Dialogue, 1970). The projects submitted by students, such as this video by Robin Miller, reflect the decisions students made about theories, theorists, social trends, technologies and other forces that shape the interactions of information and human rights. See the Rose Art Museum's website, The Justice, or the featured review in Big Red and Shiny for more information. Inaugurated during the volatile and transformative late 1960s, the unconventional publication Blueprint for Counter Education introduced the tools for a radical pedagogical model. A project of Brandeis Sociology Professor and Chair Maurice Stein and his student, Larry Miller, this “classroom in a box” encouraged students to shape an educational environment from their own lived experiences. Blueprint’s open-ended charts mapped a world of ideas, from the avant-garde to the postmodern, in a form that presaged the internet, allowing readers to chart multiple courses of thinking and discovery that anticipated the prevalence of search engines, social media, and the quick connection of the hyperlink. Organized by Caitlin Julia Rubin, Assistant Curator. This exhibition is presented as part of a citywide partnership of arts and educational institutions organized to recognize the outsized role greater Boston played in the history and development of technology. The Institute of Contemporary Art/Boston initiated this partnership to link concurrent exhibitions and programs related to the themes of the ICA exhibition Art in the Age of the Internet, 1989 to Today. Blueprint for Counter Education is made possible through support from the Lois Foster Fund and the generous contribution of Video Data Bank at the School of the Art Institute of Chicago. A lecture with Jeffrey Schnapp and Adam Michaels, followed by a workshop led by Sarah Newman. Blueprint for Counter Education is one of the defining (but neglected) works of radical pedagogy of the Vietnam War era. Originally published in 1970 and integrated into the design of the Critical Studies curriculum at CalArts, the book was accompanied by large graphic posters that could serve as a portable learning environment for a new process-based model of education, and a bibliography and checklist that map patterns and relationships between radical thought and artistic practices from the avant-gardes to postmodernism—with Marcuse and McLuhan serving as points of anchorage. In 2016 Blueprint was reissued in facsimile with an added booklet of essays and interviews about the original by Harvard’s Jeffrey T. Schnapp and the designer Adam Michaels, published by Michaels’ Inventory Press. The Lecture will be followed by a Reception in the Frances Lehman Loeb Art Center, where attendees can view both the reprinted and the original editions of the publication on exhibit. A workshop flowing from the radically interdisciplinary, heuristic, and politically energized learning models of Maurice Stein and Larry Miller’s Blueprint for Counter Education, as well as from the design-intensive research practices of metaLAB (at) Harvard, this will be an exploratory event aimed at cultivating a haptic, syncretic, approach to the learning process toward opening and broadening channels of communication and influence between the classroom, the library, the design world, and our political life. Supported by the The Agnes Rindge Claflin Fund, Department of Art, Department of Media Studies, Creative Arts Across Disciplines Initiative, Program for Teaching Development at Vassar College, Tatlock Chair of Multidisciplinary Studies, the Frances Lehman Loeb Art Center, and the Vassar College Libraries. Blueprint for Counter Education (the new expanded edition) will be on exhibit at Tom Holert's Learning Laboratories at the BAK Institute for the Contemporary in Utrecht, Netherlands. presentation and round table discussion with Jeffrey Schnapp (metaLAB [at] Harvard), Adam Michaels (Project Projects), Paul Cronin (School of Visual Art NY), Maurice Stein (Brandeis), and Larry Miller (UMass). 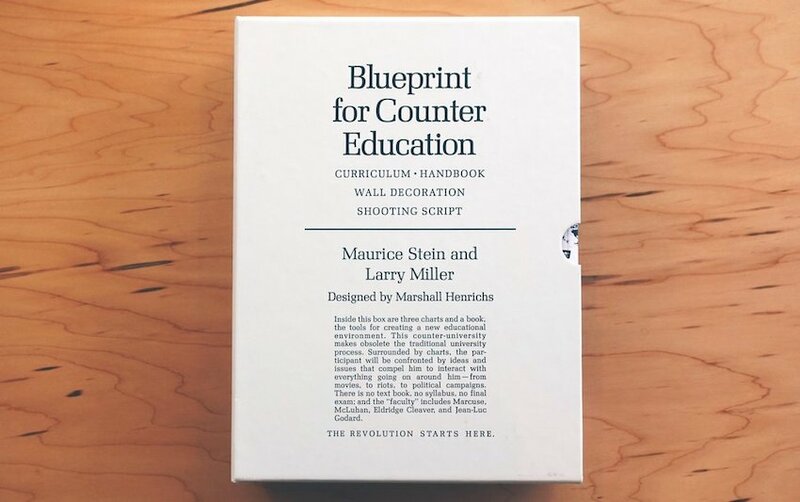 an immersive experience of the Blueprint for Counter Education reprint and the archival materials that document its development, with the metaLAB team. Blueprint for Counter Education originally appeared in 1970 and was integrated into the design of the Critical Studies curriculum at CalArts. The work assumed the form of a boxed set and was accompanied by three large posters that map patterns and relationships between radical thought and artistic practices—from the avant-gardes to postmodernism—with Marcuse and McLuhan serving as points of anchorage. Assembled into a do-it-yourself, instant classroom, the posters and the accompanying “shooting script” were meant to serve as a the basis for a new critically informed, activist, learner-driven model of education. Blueprint for Counter Education at the Printed Matter Art Book Fair, MoMA PS1, Sept 17-20, 2015; documentation by Arthur Fournier.